For Iroquois artist Jeff Thomas, Canada has always excluded his people. He made this series in order to symbolically place them back in the national picture. 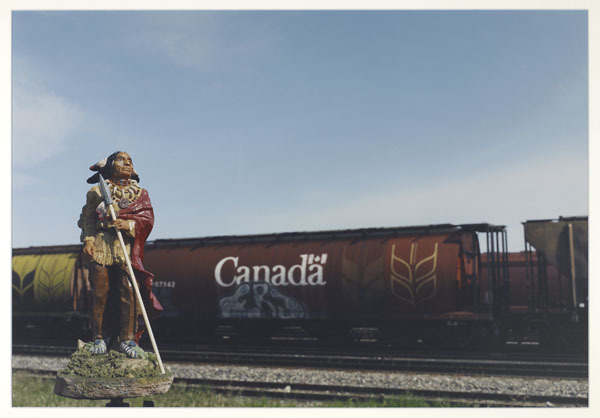 Each photograph takes back a major symbol of Canadian nationhood. I was born and raised in Buffalo, New York, and I am an enrolled member of the Six Nations reserve near Brantford, Ontario. I am a self-taught photographer and curator. My career in photography began from a near-fatal car accident in 1979 that left me with a permanent disability from a spinal cord injury. I turned to my interest in photography to begin the process of rebuilding life. My career began with two objectives: to address the absences of contemporary and of historical Indigenous photographers in archival collections. My primary objective was to address the absence and invisibility of urban-based Iroquois like me. In 1990, I was living in Winnipeg, Manitoba, when I discovered, during a research project at the Manitoba Museum, that LAC had a complete copy of Edward Curtis’s 20-volume series The North American Indian. Curtis played the role of antagonist in my early career, primarily because of his staged images of an Indigenous tribal life, which had vanished decades before. Very little was known about Curtis—wanting to know more, I moved to Ottawa in 1993 and began the next stage of my career. Indians on Tour began in the summer of 2000 during a walk around the Parliament Hill area in Ottawa. I had a plastic toy Indian figure in my camera bag, and when I stopped to photograph a statue of an Indian hunter, I placed the toy Indian in front of the bronze hunter and photographed the two. What transpired when I saw the photograph was a new level of possibilities for me in addressing absences of Indigenous representation in the everyday world. From that point, I started taking the plastic figures with me wherever I travelled. I eventually added new Indian figures that I discovered in tourist shops, and to make posing them less reliant on a flat surface, I started making portable dioramas for the figures, mounted on a portable light stand. In 2005, I was in Brandon, Manitoba, for an opening of my work, and since the next day was Canada Day, I drove around the city looking for an interesting site to pose the delegate. When I saw the grain car with “Canada” and some graffiti on its side, I knew I had found the site for my Canada Day image. An important point is that the original caption was not deleted, so researchers will see both captions in the database. The new caption inspired a researcher to try and identify the woman, and the new information he found was subsequently added to the database caption. It was amazing to see the impact that changing two words had on one photograph. I suspect that once more Indigenous people use the database, someone from her community will add her name to the caption. 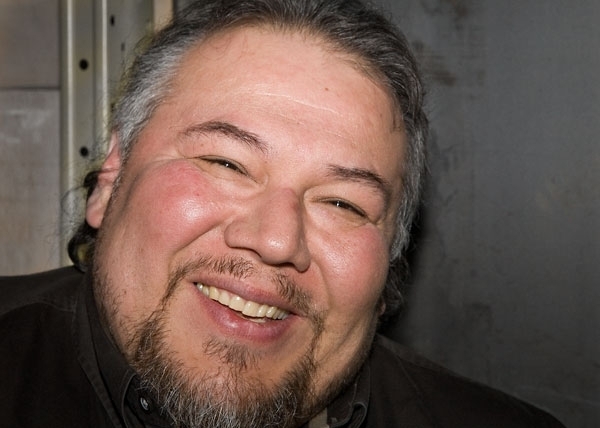 Jeff Thomas is an urban-based Iroquois, self-taught photo-based artist, writer, public speaker and curator, living in Ottawa, Ontario. He has works in major collections in Canada, the United States and Europe. Jeff’s most recent solo shows were Mapping Iroquoia: Cold City Frieze, McMaster Museum of Art, Hamilton, Ontario; Resistance Is NOT Futile, Stephen Bulger Gallery, Toronto, Ontario; and The Dancing Grounds, Wanuskewin Heritage Park, Saskatoon, Saskatchewan. Thomas has also been in many group shows, including l:ke – Toronto: Tributes + Tributaries, 1971–1989, Art Gallery of Ontario, Toronto, Ontario; Land/Slide: Possible Futures, Markham, Ontario; SAKAHÀN, National Gallery of Canada, Ottawa, Ontario; and UNMASKING: Arthur Renwick, Adrian Stimson, Jeff Thomas, Canadian Cultural Centre, Paris, France. In 1998, he was awarded the Canada Council for the Arts’ prestigious Duke and Duchess of York Prize in Photography. He was inducted into the Royal Canadian Academy of Art in 2003. In 2008, he received the Karsh Award in photography. This entry was posted in Exhibitions and tagged Canada150, Exhibitions, First Nations, Photography, Project Naming by Library and Archives Canada Blog. Bookmark the permalink.